Go ahead. See it. This is not great cinema, but it is great fun! 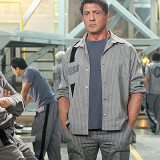 We have to admit we took a certain guilty pleasure in seeing meatheads Arnold Schwarzenegger and Sylvester Stallone team up for the by-the-number prison break thriller Escape Plan. These burly dudes aren’t nearly as buff as they once were, but they still love to brawl. Schwarzenegger (who, shockingly, speaks pretty extensively in his native tongue in this film) acts and looks better than Stallone, whose melted marshmallow features can be distracting. Probably too old to be playing action heroes, the two guys at least don’t take themselves too seriously and tend to take roles that are fairly age-appropriate. That’s the case here as Stallone plays Ray Breslin, a brilliant (yeah, try to buy into that) veteran security specialist who runs his own business. Schwarzenegger is Emil Rottmayer, a guy with connections to some high-power criminals. After the C.I.A. comes to him with a proposal to be locked in a new, high-tech prison, Ray goes along with the plan. After all, he’s even written a how-to book of sorts on building the perfect prison. It doesn’t come as a surprise, then, that Ray would find himself in a prison designed to his specifications. Picked up in New Orleans by a group of thugs who proceed to drug and blindfold him before stuffing him in a van and whisking him off to lock-away, Ray wakes up to find he’s been placed at an undisclosed location. Initially, he tries to use his “safe word” to be released. When that doesn’t work, he enlists the help of Emil, and the two establish a friendship of sorts as they find they have a common enemy in the prison’s vicious warden Willard Hobbs (Jim Caviezel). Ray tells Emil of his plot to break out of the place and the two begin scheming. While Swedish filmmaker Mikael Håfström (1408, The Rite) does a decent job of building suspense and there is a Twilight Zone-like twist midway through, the film’s ending isn’t a huge surprise to anyone. Schwarzenegger and Stallone have pretty good chemistry and deliver some terrific one-liners, but its predictability and cartoonish bad guys drop the film squarely in the B category. (It’s also a little derivative of the Die Hard series, so perhaps it’s appropriate that Bruce Willis was originally cast as Ray Breslin).